Let us, pet parents, admit one simple fact when it comes to sweater purchase - we can NEVER have enough Fair Isle sweaters. I don't think we need to rationalize this simple fact anymore. There are millions of diverse versions of this famous pattern and our in-house designers could literally come up with endless combinations of shapes and shades. 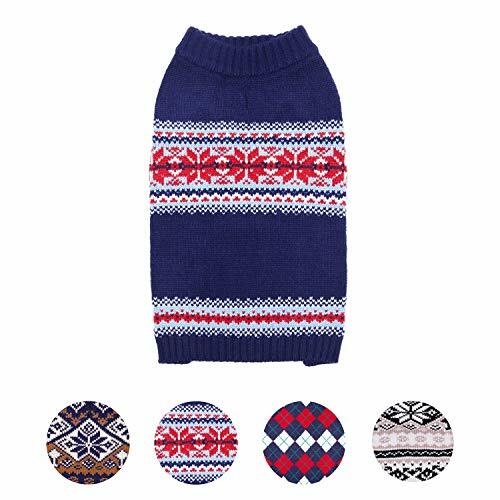 Sweater is always the key essential for fall and winter season whenever your pooches need the extra care and warmth. There are 3 key shades of colors that bring out the best of the cooler season - navy blue, true red and white. It features patterns of snowflakes, dots and other iconic shapes to add the right amount of modern touches for the all-time classic piece. You can literally put this sweater on your pup and rush to a festive dog photo shoot. And we are sure that your pup will get compliments for the right style choice!